Well, I think I've got a very clever Husband because it's quite likely he's sussed out what's caused our power problem and we might be able to fix it without any assistance! If you've read our last blog you'll know we've been having major issues with T4rdis2's lithium ion battery - and last night at about 9pm it failed altogether! There we sat in a small Aire at La Breole in the pitch dark with neither water or heating available to us (to draw water the water pump needs power), and we thought that because the battery had drained completely it would be knackered altogether! As a bit of background info, about 3 months ago we changed from 2 lead acid batteries to 1 lithium ion one (and it wasn't cheap), because by only having one unit we could save about 50 kg in weight, and also the lithium one would increase the power available to us and make it possible to charge our bike batteries while we were off grid. Anyway, with little else to do last night we pottered off to bed - but rather that sleeping John lay pondering about our circumstances, and by morning he was fairly sure he knew what had caused the problem - therefore, I told him sleep was over-rated and it had been time well spent! Now, I'm a bit thick when it comes to understanding things like volts, amps and watts - so to make it easier for me John likened our battery to a water storage tank with a hose attached. He explained that the water would keep flowing out until the resevoir was empty, and then even if only a little was put back it would flow again. Happily to cut a long story short, when we got up this morning the power was back on and our indicator had 2 red lights, and by the time we'd driven the 75 miles of today's journey all the lights were back on. However, now we understand how the battery works we knew it would still be far from fully recharged. Therefore, our plan was to go on a campsite and keep the van plugged into the mains, and to ensure we only used the battery for essentials over the next 3 days, and then hopefully it will be fully recharged and the problem will be fixed 🤞. 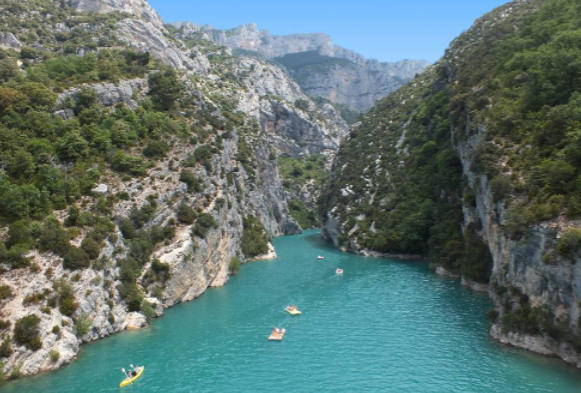 So with that in mind we changed our planned itinerary completley and instead of staying in the mountains we set a course for the Gorges of Verdon which lie in a UNESCO Geo Park in the Alps-de-Haute-Provence region of France. 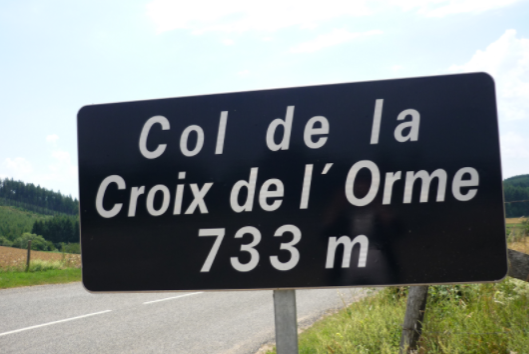 On our way we passed over the 'little' Col d'Orme and through huge swathes of countryside covered in lavender plants - it must smell and look spectacular when there all in flower - and nearly every other shop sells Lavender Miel 🐝🐝🐝! While we're here we plan to walk as far into the lower gorge as possible, and if all we've read about it is true I think we'll be in for a rare treat - but I'll tell you about that in tomorrow's story! Wednesday morning dawned warm and bright so as planned we set off to walk into the Lower Verdon Gorge where a path follows the route of both the river and the old Verdon Canal . The river is a striking turquoise colour which is apparently the consequence of it's glacial sources and minerals that are suspended in the water! The canal is more or less derelict now but it was originally a man made hydraulic structure that was 80 km long and was built in the 19th century to carry water from the Verdon River to supply towns and villages along it's way, and it wasn't decommissioned until 1969! You can just about see one of the little bridges we had to cross! To start with our walk was either on a precipitous rough path cut into the craggy rock sides with bridges and staircases to assist us on our way, or it was on what used to be the canal's guard path - and it was from here that we could see into the canal tunnels which are now home to quite a few different species of rare bats! .... and this chucked us out onto a forested scenic path in the vale of Sainte Maxime which was overhung by arches of hundred year old box trees, and which wound it's way back up the valley slopes. The path eventually led us to the Sainte Maxime chapel which is isolated high up on the cliff top and it's a place where the inhabitants of Quinson (the town near where we're staying) come on an annual pilgrimage. However, today it was the domain of some very cute goats! We ate our picnic there and we were lucky enough to scoff our sarnies before they spotted us, but other hikers were forced to share when the little buggers reared up and almost took food out of their mouths - it was quite funny but I daren't take a pic of them actually doing it! Then once we got going again the path continued across the plateau de Male-Sauque and then steeply downhill back towards the river and the start of the walk - we reckon it was about a stunningly lovely 9 miles in all - but with the hot sunshine and rough terrain we wouldn't really have wanted it to be any further! There were alternatives to walking! Thursday turned out to be another lovely day, but after our previous day's exertions we decided to just stay at 'home' and potter! John gave T4rdis2 a good scrub outside and I did our washing and some baking - scones and lemon drizzle cake - so guess what we had for high tea? yum yum! First off I feel the need to comment on the weather - today was another scorcher, and really we've been very lucky on this tour so far! Since the rainy weather that kept us for a day or two nearly 3 weeks ago, we've mostly enjoyed sunshine for most or part of every day. So what did we do today? Well we nearly made a big mistake! When we hiked through the Lower Verdon Gorge on Wednesday we thought we'd seen the best of it - but that assumption was very wrong cos that happened today! Originally our plan was to drive back North for about 50 miles so that we could ride up the Col de la Cayolle, but while John was perusing his maps last night he spotted The Route des Cretes which he thought looked very interesting and which runs along one side of the main part of the Verdon Gorge. However, it didn't really look like a road that would be suitable for T4rdis2 because in places it becomes very narrow and there is also a section that is one way only. 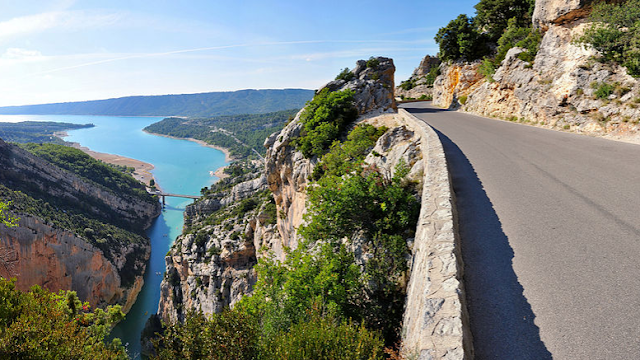 Therefore, we decided to drive to the town of La Palud-sur-Verdon and leave the van in a campsite there and cycle the route! So with our itinerary in place we packed up and left our campsite at Quinson and headed along the D952 for about 35 miles - and this proved to be another nail biting journey along more narrow windy precipitous roads! John takes it all in his stride and stays as cool as a cucumber, but me - well I'm almost hopping about, gasping as we round blind bends and things come a little close for comfort, and I've even been known to swear at the odd pesky tourist who stops in inappropriate places to take pics! However, even I have to admit that the Lac de Ste-Croix was such a stunning site a picture just had to be taken! We arrived at the campsite at La Palud at about 11.45 and found that it was very aptly named - Camping Municipal le Grand Canyon - it's a very pretty place with lots of weeping willows so T4rdis2 didn't feel in the least put out at being left all alone there! 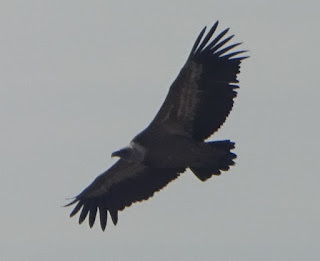 The pictures could never do reality justice, but it was just stunning - and having visited this Gorges American counterpart, we both agreed this one won hands down for sheer grandeaur! We completed our afternoon ride of 15 miles (with lots of stops) at about 4pm, but as we'd put lots of effort into the uphill bits we rewarded ourselves by finishing off yesterdays scones - with cream and jam of course! Tomorrow we're heading back to Guillaumes and the Col de la Cayolle, but on the way we'll hopefully be taking in more Gorge-ous scenery as we pass through the Daluis Gorge, but for now that's all from us for this episode!